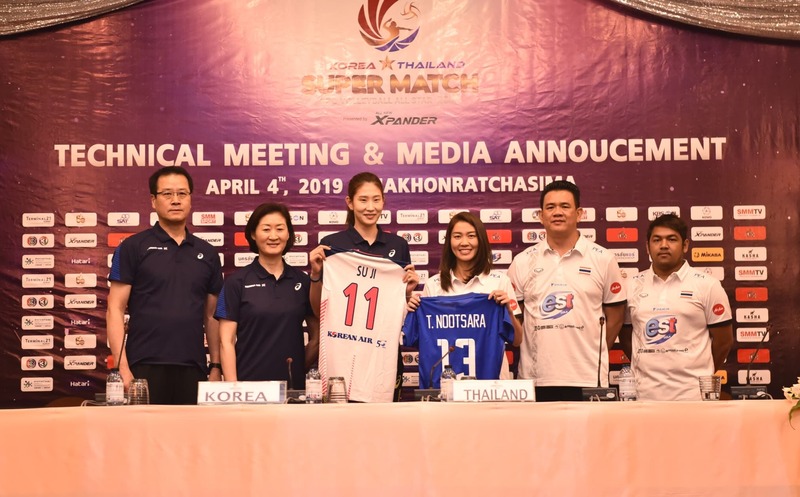 Nakhon Ratchasima, Thailand, April 4, 2019 – The Korea-Thailand Pro Volleyball All-Star Super Match 2019 Presented by Mitsubishi Xpander is all set to be kicked off on Friday at the Terminal 21 Korat Gymnasium in Nakhon Ratchasima. AVC Secretary-General Mr Shanrit Wongprasert, as the Control Committee chairman, presided over the Technical Meeting and Media Announcement of the volleyball exhibition game between the two nations hosted annually by the Korea Volleyball Association (KVA) in conjunction with Korea Volleyball Federation (KOVO) and Thailand Volleyball Association. Also in attendance as guests of honour were Nakhon Ratchasima Deputy Governor Mrs Piyachat Insawang, Terminal 21 Korat Director Parichaya Na Nakornpanom and Mr Prajaya Chaiyakam, Managing Director of Sport & Multimedia Business of Siam Multimedia (SMM). 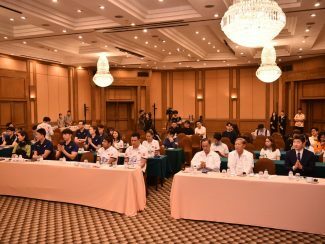 Team head coaches and captains of Thailand and Korea as well as the media also attended the Thursday’s meeting at the Sima Thani Hotel. 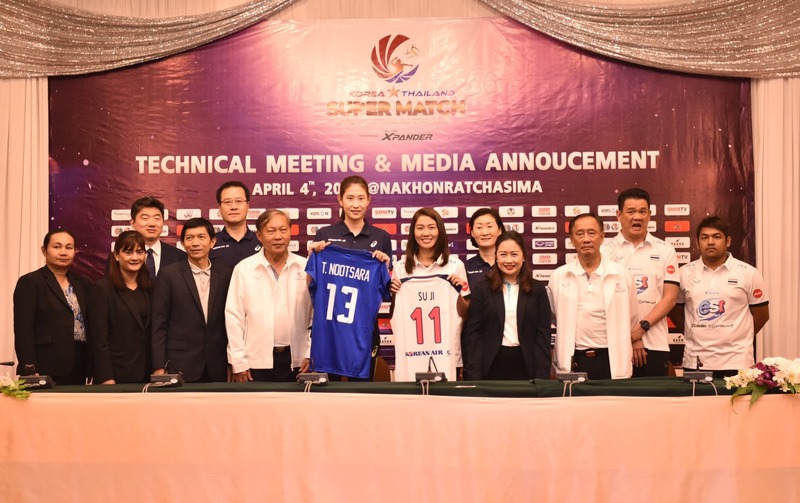 The All-Star Super Match was first played at the Indoor Stadium Hua Mark in Bangkok on June 3, 2017 which saw Korea, spearheaded by promising Kim Yeon-koung, narrowly beat hosts Thailand 3-2. 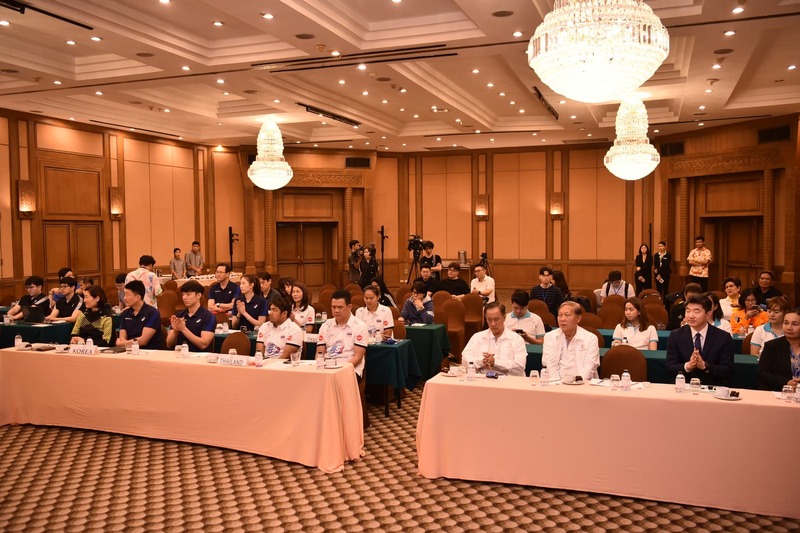 The Thai team avenged the loss in the same fashion following a dramatic 3-2 win against hosts Korea in the second edition at Hwaseong the following year. In the Thursday’s press interview, Mr Danai Sriwatcharamethakul, head coach of the Thailand women’s national volleyball team, has expected a good match on Friday and hoped that his players will do their best in front of home fans. “Despite a short period of training together, I’m confident we are ready for the match. We will use individual talents of each player in our team as assets to make a good match against Korea. I hope that the Friday’s match will be one of the most entertaining to watch and cheer on. As far as I’m concerned, Korea and Thailand are always locked in a very tight contest when playing together. However, we will try our best in front of our home fans. Tomorrow is ours to win or lose. It doesn’t matter who you face, but it’s how you play that matters,” said Danai. Korea All-Star team head coach Park Mi-hee also admitted that her players prepared for this match in a very short amount of time, but they will do their best. “This is our third time to play Thailand in the All-Star Super Match. Our professional V-League in Korea has just completed and that’s why we had a very short time in training together. Nonetheless, I hope that my players will try their best in the match against hosts Thailand,” she said. Korea All-Star team captain Kim Su-ji has expected a good match against Thailand and a large number of fans at the competition venue. “I hope that our match against Thailand will be a good contest with players of both teams entertaining spectators with their efforts, determination and a fighting spirit. I also hope high that a number of Thai fans will come cheer both teams at the competition venue and I believe they will give us a warm welcome as they always did when we arrived here in Thailand. The Friday’s match must be one of the entertaining, most-watched games,” she said. 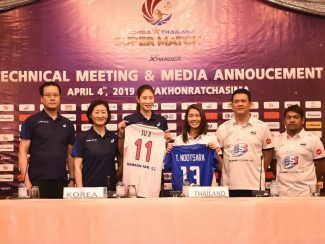 The Korea-Thailand Pro Volleyball All-Star Super Match 2019 Presented by Mitsubishi Xpander is due to take place at 12.00pm at Terminal 21 Korat Gymnasium in Nakhon Ratchasima. Thailand took on Korea for several times last year. Apart from the All-Star Super Match 2018 which saw the former beat the latter 3-2, Korea stunned Thailand 3-1 in the Volleyball Nations League fourth-week preliminaries in Nakhon Ratchasima. After that, Thailand pulled off a surprise 3-1 win against title-holders Korea in the semi-finals of the 2018 Asian Games women’s volleyball tournament in Indonesia. The Thai team repeated the similar feat over the same rivals following the hard-fought 3-2 win in the Pool C preliminaries of the FIVB Volleyball Women’s World Championship in Japan. 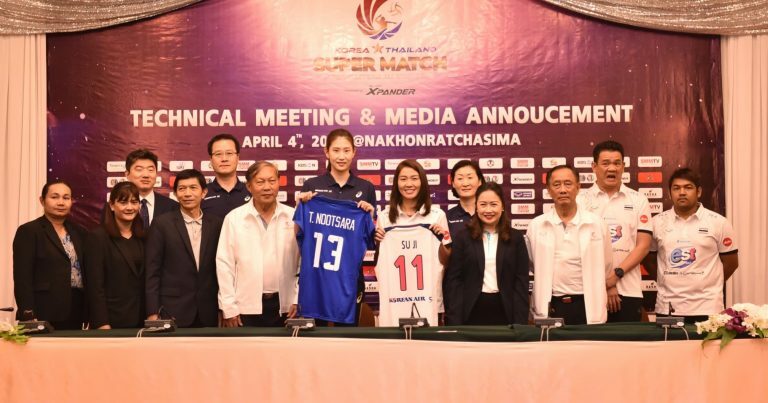 Thailand beat Korea for the fourth time in 2018 when they powered past a young Korean side in the Pool A preliminaries of the AVC Cup for Women in Nakhon Ratchasima, Thailand.